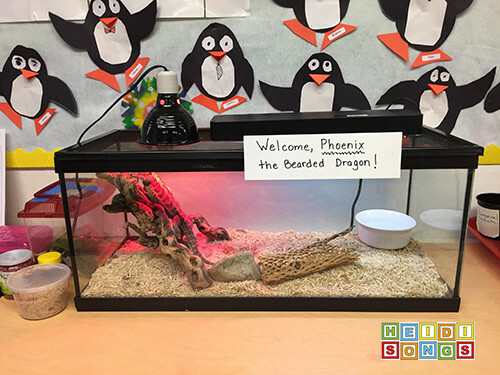 A Bearded Dragon Class Pet! 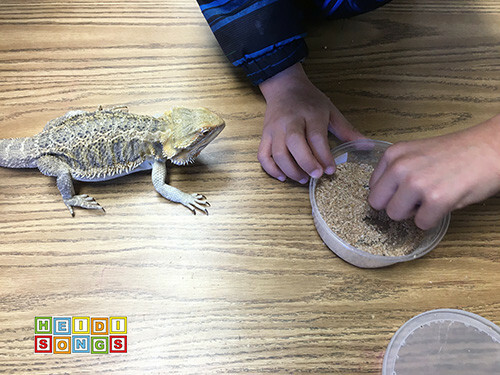 Have you ever wanted a class pet that your kids could actually PLAY with? 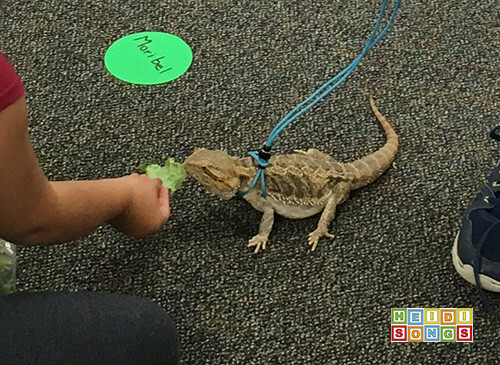 Have you wished for a class pet that is sturdy enough to be handled by little kids without much fear of injury? How about a pet that would not cause an allergic reaction? Have you wished for a pet that would be active during the day, and that the kids would not lose interest in? 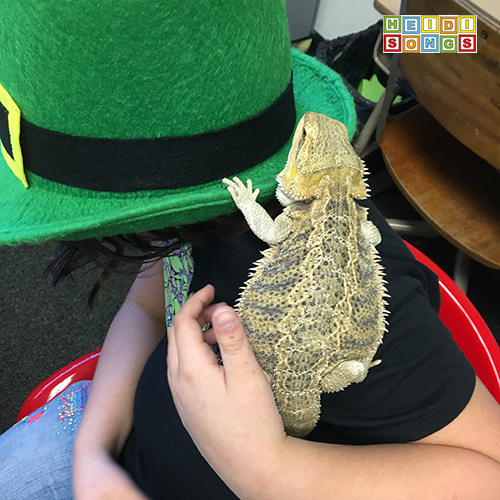 Then a bearded dragon lizard is a great choice for you! Sound intriguing? Read on! 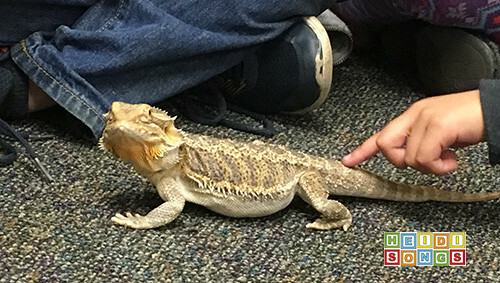 Although they were certainly all fascinated, my kids had mixed reactions to him at first, because he is big (about 12 inches long! ), spiky, and maybe even a little scary looking! Some of them wanted to touch him, and others did not. But now that they have all learned that he is friendly and how to pet him (going with the scales and not against them,) they are all quite proud of the fact that every single one of them can confidently hold him AND feed him! We love the harness that I got on Amazon right here! I once took him to an assembly that was likely to run long- the school talent show. 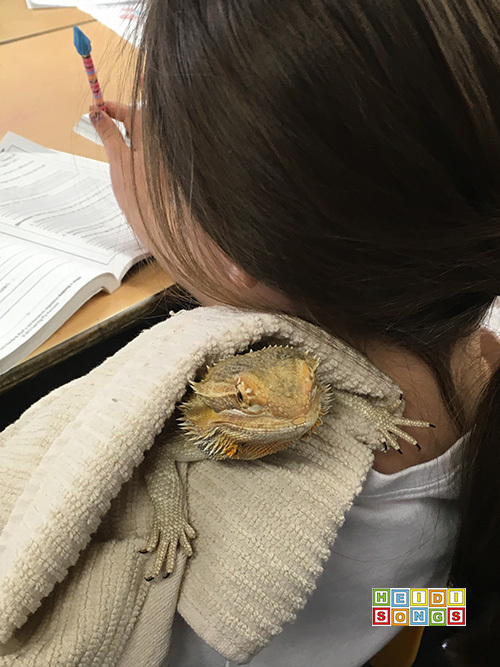 I thought it might be hard for the kids to sit through, so I brought along the bearded dragon. The kids took turns sitting by me during the assembly and holding him during each act. They had to be on their best behavior to get a turn. There were 20 acts, so each child got a good long turn with him. It worked out great! 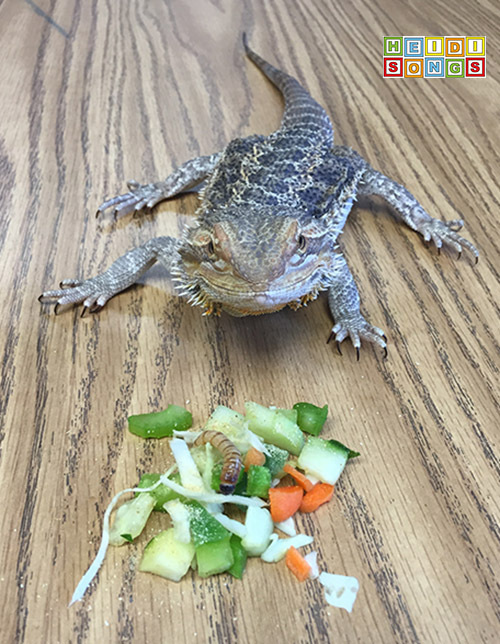 Another great thing about having a bearded dragon in the classroom is that he is okay by himself over the weekend. I can put a bunch of lettuce in his terrarium before I leave on Friday, and if he has been eating well all week long, I know that he will be fine until Monday. Otherwise, I can throw a dozen crickets in there and he can eat them over the weekend if he wants to. But the funny thing is that he usually just chases them all over the tank and eats them all up immediately, leaving him nothing leftover to eat over the weekend. And still, he is just fine all weekend! So I guess it's all good. The first week or two that we had him, we all gathered around a table and fed him together in our room. He eats meal worms, crickets, and fruits & vegetables such as lettuce, apples, and spinach. He even eats roaches! (These are not cockroaches; they are different type of beetle and are purchased specifically for the purpose of feeding reptiles.) These roaches look a lot like flat beetles. This was fun, but was taking up too much class time. So we have now developed a routine of choosing four kids per day to be "Dragon Feeders." 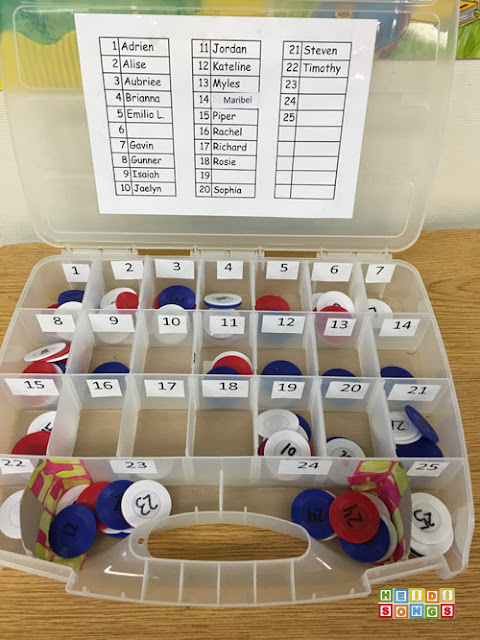 When the kids are good, they can earn a chip with their student number on it (pictured above!) and put it in any one of four different reward jars: "Dragon Feeder," "Line Leader," "Helper," or "Surprise." 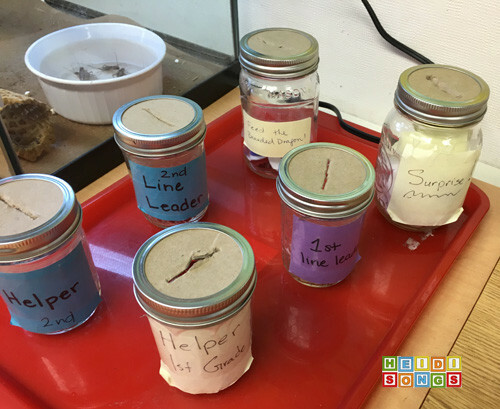 Each morning, I choose my helpers and line leaders from these jars (one from each grade, since I have a first and second grade combo class.) Then I choose four chips from the Dragon Feeders jar! This is really the FAVORITE reward that kids like to work for! Most of them would rather be a Dragon Feeder than get a prize from the prize box or do anything else, really! 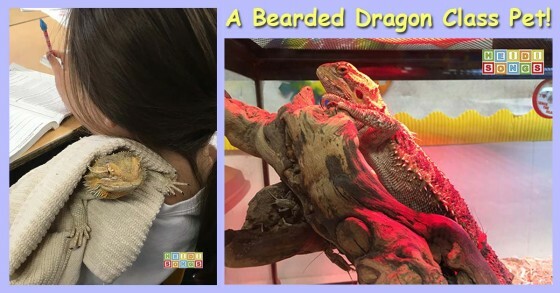 My four "Dragon Feeder" kids for the day get to stay inside at recess and feed the bearded dragon. They now also take him for a little walk and give him a warm bath! 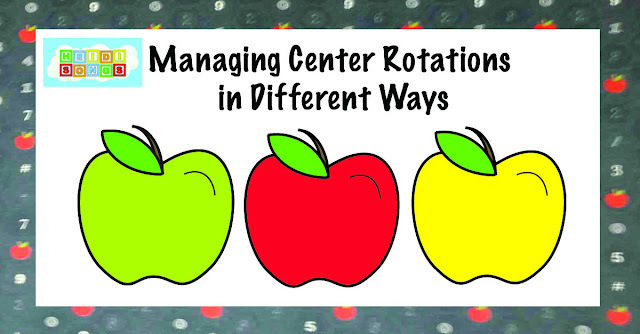 They can all do these things now without help; I just need to be in the room. They hand feed him bits of lettuce, meal worms, and roaches. 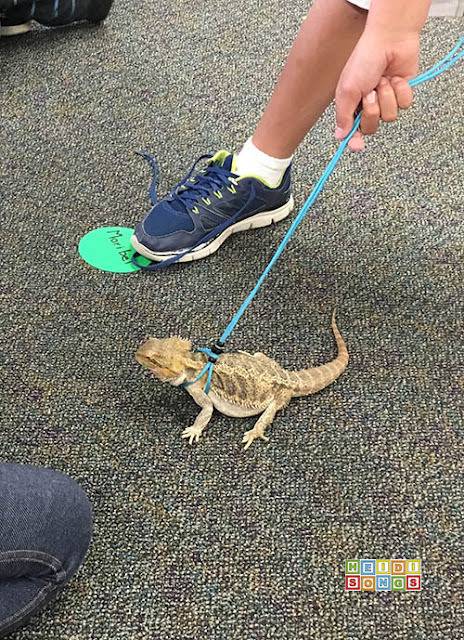 Then they put his little harness on him and let him wander around the classroom for a while. After that, they warm up a little water in the microwave for his bath and let him soak for a few minutes! 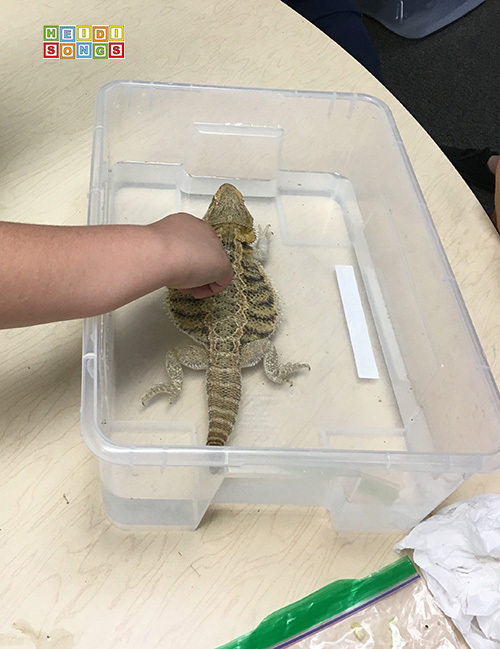 One of the best things about having a bearded dragon for a class pet is that they are very hardy animals. 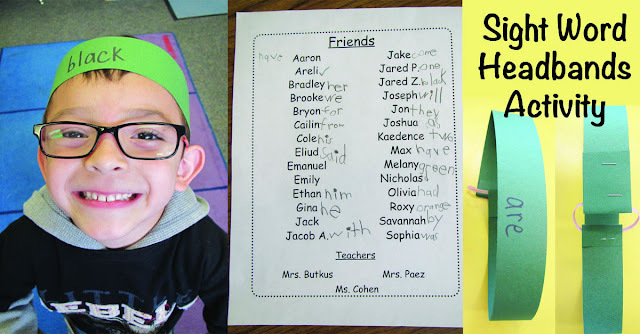 They are not fragile, and can take a little bit of childish mishandling without the teacher being afraid that the kids will injure the pet, or worse. He has actually been dropped a couple of times, or perhaps actually jumped off of them! It's hard to tell. In any case, he has ended up just fine. Hooray! I was lucky that my beardie was a gift! But a purchasing a bearded dragon may cost around $50-70, depending on where you buy him. The last one I saw for sale at the pet shop was $60. I'm sure that the prices vary! But I know that there are grants available for setting up teachers with class pets. Just search online. The terrarium (or old aquarium) can be expensive if purchased new. A garage sale is a likely place to find one, but it will need a lid. 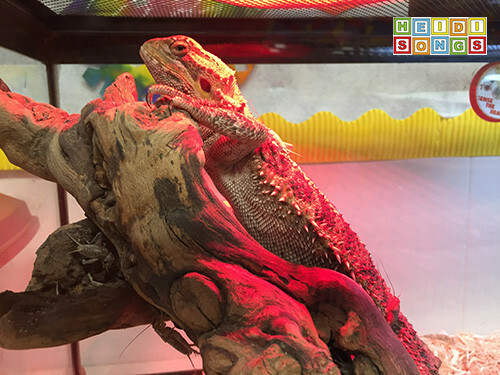 Besides the dragon and the tank, here are the other supplies you need: bedding for the bottom of the terrarium, a water bowl, something to climb on like a piece of driftwood and/or a rock, a heat lamp, and a light on a timer that is specially designed for reptiles. These lights are normally about $30-40 each and can really only be purchased at a pet shop or online. They should be set to go on with the sunrise and off with the sunset. These lights are important because they give off the UV light that the reptiles would get in the desert, their natural habitat. The problem with the lights is that they only last about six months, and they are pricey! The food is another money issue, unfortunately. The mealworms can be expensive, depending on where you purchase them. One pet shop I get them at charges $9.99 for 50 of them! Another one charges $7.99. The problem is that I know that I can get 500 of meal worms on Amazon for about $15 dollars, but he only eats about nine or ten a day! So I don't know if I would be able to keep so many extras alive for very long! It's a dilemma! Giving him bits of fruits and veggies doesn't seem to be a big issue, since I have those things in my kitchen; I can just give him extras from there. :) Basically, the biggest issue with having him in my room is that I have to go to the pet store weekly to get his worms and/or crickets. If I could solve that problem, he would be pretty much trouble free! One more little problem is the claws. They can become sharp and would have to be clipped. I have had him for four months now, and have't trimmed them yet, but I can see that it is time! Some of the children don't like the feel of his claws, so they hold him with a towel. Also, you might want to know how often I have to clean his tank. Basically, I just wait until I see some dried up poop in his bedding, pull it out and then wash my hands. I have not yet had to remove the entire tank, empty it, and hose it down or anything like that! He usually poops in his bath each day, so there isn't much. There is a type of bedding that is like sandpaper, though. You can put it down on the bottom of the tank and then pull it out and rinse it off weekly. He has that now because the family that took him home over spring break bought it for him. However, I think he may miss the shredded bedding he had before, because he used to burrow and dig in it. I think I will get him some more shredded bedding to put on top of it. The last issue for me is simply that I have kids in my room at recess time! As a human being, this does get tiring after a while, because I need a break. Next year, I may find a different way to handle it. But especially in a combo class, there seems to be a great shortage of instructional time, so I just felt like something had to give. One days when I just can't handle it, I tell them that the Dragon Feeders will have to wait until tomorrow and I feed him myself, and take my break. I keep those same names that I pulled up until the next day. If you decide to try it, let me know! We have had a lot of fun with ours! Also, if you have any tips for me, I would love to hear it. 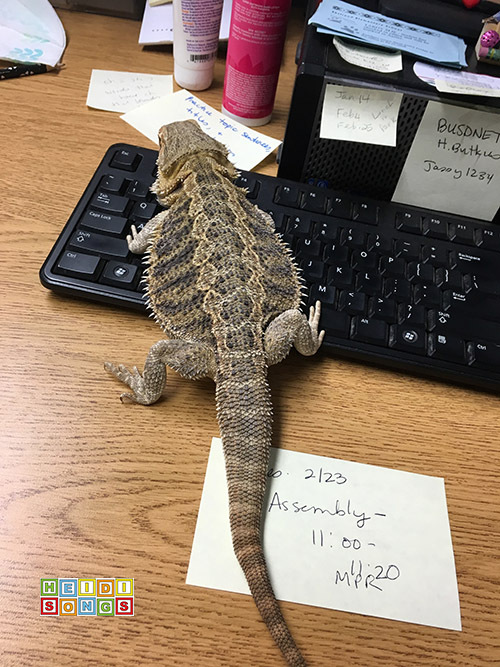 What's your favorite class pet? 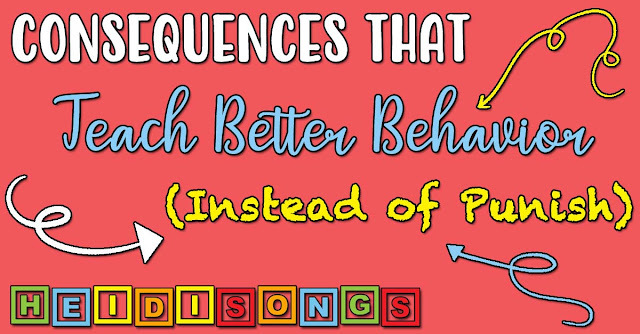 What about Letters and Sounds?? Do you have a favorite song? Ever wondered what it's like at one of my conference presentations?? Here's a little video we made to give you an idea! I would love to hear about your classroom pets, if you have any!